JaVale McGee scored a career-high 33 points, but it was not enough, as the Los Angeles Lakers lost to the Brooklyn Nets, 111-106 on Friday night at Staples Center. The inevitable has happened: the Lakers have officially been eliminated from the postseason. The Lakers were in fourth place in the Western Conference on Christmas Day, but after LeBron James missed the next 17 games with a left groin strain, the Lakers sank out of the playoff picture and were never able to climb back into the hunt. The Lakers have lost five consecutive games and 12 of their last 14 overall, making Friday's loss more of a formality than a surprise. The team has been in "tank mode" for the month of March, and have been closer to a lottery pick than they have a playoff spot. "We've been struggling in March," said Lakers' point guard Rajon Rondo. "It's been pretty bad. We just focus on trying to win, playing with pride, and trying to get a W."
A lot was made before the game about the return of former Lakers' guard D'Angelo Russell to Staples Center. Russell was drafted by the Lakers with the second overall pick in the 2015 NBA Draft, but was traded before the 2017-2018 season after Magic Johnson took over as team president. "This is definitely where I started," said Russell, who was iniatially upset about Johnson's comments that he was not a leader after the trade was finalized. "It's definitely a place that gave me an opportunity. Not many guys started somewhere and then that was forgotten throughout their career. You know, Chauncey Billups, the [Steve] Nashes of that group, so I'm trying to consider myself one of those guys." The trade allowed Johnson to draft point guard Lonzo Ball and clear enough cap space to sign LeBron James this past summer. Most people thought the decision to trade Russell was smart at the time, but with the Lakers spiraling back into mediocrity and Russell leading the Nets to the playoffs, many question the decision in hindsight. While it seems obvious on paper: would you rather have LeBron James and Lonzo Ball or D'Angelo Russell? The answer might not be so cut and dry. James is a declining asset, whereas Russell's stock is on the rise. Ball has missed significant time with ankle injuries over the last two seasons, and thus far has not lived up to his pre-draft hype. Of course, Friday was not the first time Russell had faced his former team, but it did mark the first game against the Lakers where he was an NBA All-Star and the leader of a playoff-bound team. Additionally, Russell was coming off a career-high 44 points, and led one of the largest comebacks in NBA history as he helped the Nets erase a 28-point deficit to rally to beat the Sacramento Kings on Tuesday. "That was huge," Russell said of the back-to-back wins against the Kings and Lakers. "We knew how big these games were for us. With our record and where we are in the standings...we went out there and handled business." Russell finished with less than half that total on Friday, scoring 21 points and dishing out 13 assists against his former team, but perhaps there was a hint of poetic justice in the fact he was able to eliminate the team that shipped out of town from playoff contention. "Sounds good on paper, but at the end of the day, we're not playing them," Russell said about mathematically elminating the Lakers. "We're not competing against them for seeding, so the win is good enough." The reigning NBA three-point Champion, Joe Harris, drained six three-pointers in the contest and finished with a team-high 26 points. "That's my job," Harris said of his six triples. "That's what i'm out here to do. I'm happy to get a couple of shots to fall early and allowed my rhythm to be there. It gave me a little more confidence and taking a couple more aggressive looks." Jarrett Allen had a double-double with 13 points and 11 rebounds and DeMarre Carroll chipped in 15 points. "It was not Picasso out there by an means; it wasn't beautiful," said Nets' head coach Kenny Atkinson of the victory. "Give the Lakers credit. Obviously they got LeBron James out there, they're very talented. It was good to close it out, it wasn't easy." McGee led the Lakers with 33 points, 20 rebounds (12 offensive) and six blocks, becoming the first Lakers player to post a stat line like that since Kareem Abdul-Jabbar did it with the Purple and Gold in 1978. "I've always loved blocking shots, but I think I had 12 offensive rebounds, that might be a career-high for me," said McGee of his career night. "Everybody was focusing on LeBron and he was setting it up for me to be succesful out there." James finished one rebound shy of a triple-double with 25 points, 14 assists, and nine rebounds. Kyle Kuzma had 18. With James back on the court following a scheduled off day in Milwaukee on Tuesday, the Lakers were in the game from start to finish. 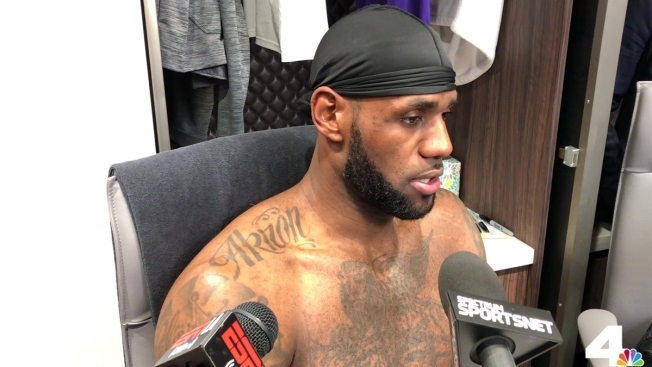 "We gave ourselves a chance to win tonight," said Lakers' head coach Luke Walton. "I thought we did a lot of things to a level that when you do, you will win NBA games at home...I give our guys a lot of credit for coming and competing like that again tonight. Unfortunately, it ended up in a loss again." The back-and-forth battle featured 16 ties and 23 different lead changes before Brooklyn held on to the victory and swept the two-game seasons series with Los Angeles. The Lakers trailed by just three points with thirty seconds remaining in the game, but James slipped along the baseline and fell out of bounds causing a turnover. The Nets would seal the game with free throws from there. The Lakers have missed the playoffs in six consecutive seasons, but this year will mark the first time LeBron James will not be in the postseason since 2005. "I've played a lot of basketball over the last 16 years," said LeBron as he faced the idea of not playing in the postseason. "For me to be able to go into an offseason as healthy as possible it gives me a lot of time to recalibrate my body, recalibrate my mind as well, and get ready for next season." The Lakers missed the playoffs that year as well, their first without Shaquille O'Neal and Phil Jackson after a reign of four straight NBA Finals appearances. Ironically, current Lakers head coach Luke Walton was in his sophomore season with the Lakers at the time. Lonzo Ball (left ankle sprain), Josh Hart (right knee), Lance Stephenson (left toe) and Brandon Ingram (shoulder) all missed the game due to injuries. The Lakers will host the Sacramento Kings on Sunday night at Staples Center.